My first experience with orchids was not a good one. The plant was in poor shape when I got it... no, it was in TERRIBLE shape, and despite all of my efforts to save it, it shriveled up and died. But then, I purchased two more dying ones from Walmart. That time I only killed one of them. So it was a pretty steep learning curve for me. I learned tons about care and cultivation along the way, and this year, the surviving orchid put out a spike for me. I can't tell you how excited I am to see what color my blooms are going to be. Everybody's seen the orchids in the big box stores. They always look so beautiful, blooming out of season. They seem to sell, but I don't too often see orchids doing well in homes. I hear a lot of people say they bought one and it died two months later. 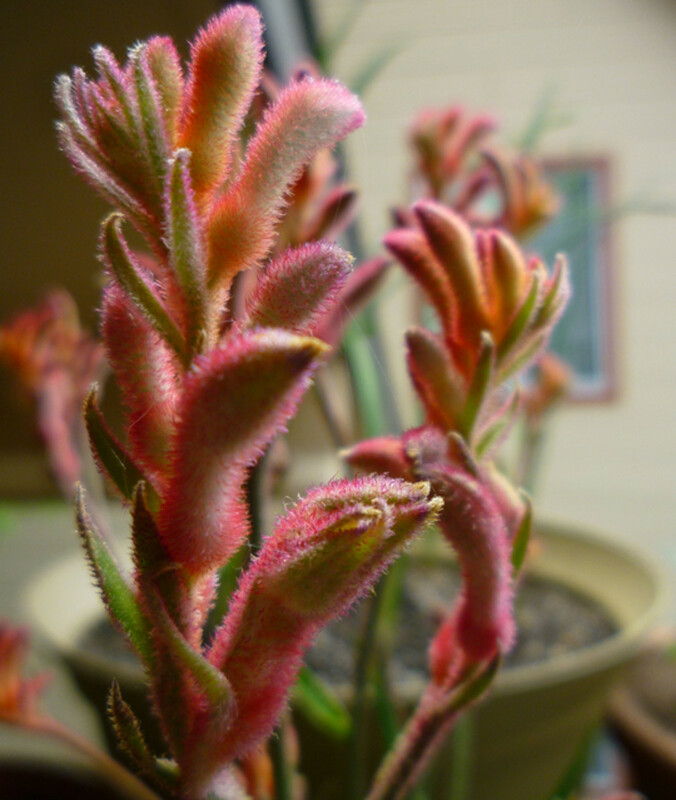 Then the orchid is blamed for being "fussy" or "difficult." 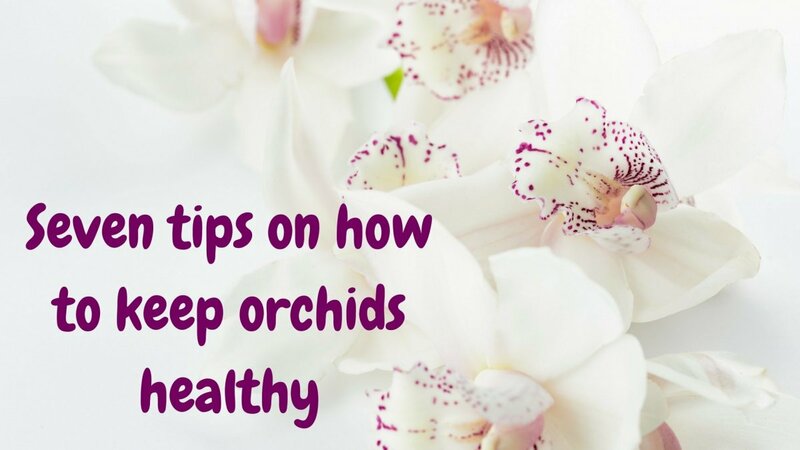 One thing that is very important to remember when you're purchasing an orchid from a big box store (although greenhouses and local sellers usually do a better job selling a plant that will survive) is to make sure your plant is healthy. 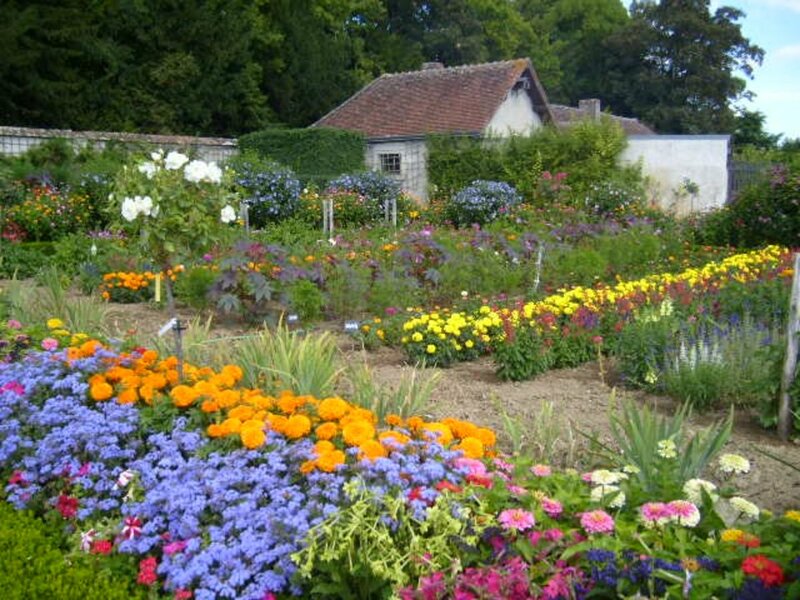 Make sure there are no dead flowers or leaves laying in the medium; they rot and cause disease. Before you decide on a particular plant, lift the sphagnum and dig gently into the pot. If the roots are plump and green (or silverish) in colour, you have a healthy root system. 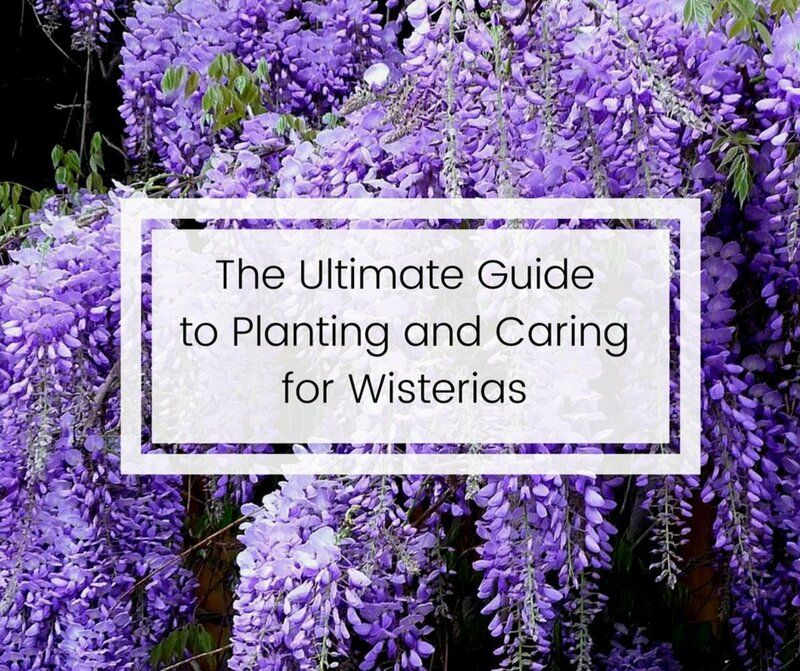 If they are on average yellow and a little mushy, you might salvage the plant. Don't pay more than 25% of what the store is asking for it though, you may just end up with a pot in the end. If the roots are brown and mushy or the crown is black, you will not save the plant. It's already gone. An orchid's roots are green because they perform photosynthesis. They need sunlight and air just as much as they need water and nutrients. Sphagnum moss harbours TONS of bacteria and diseases. Sphagnum moss stays wet for a long time, this can lead to root rot and asphyxiation. You will lose your buds. If conditions are favourable however, you may get a new spike. 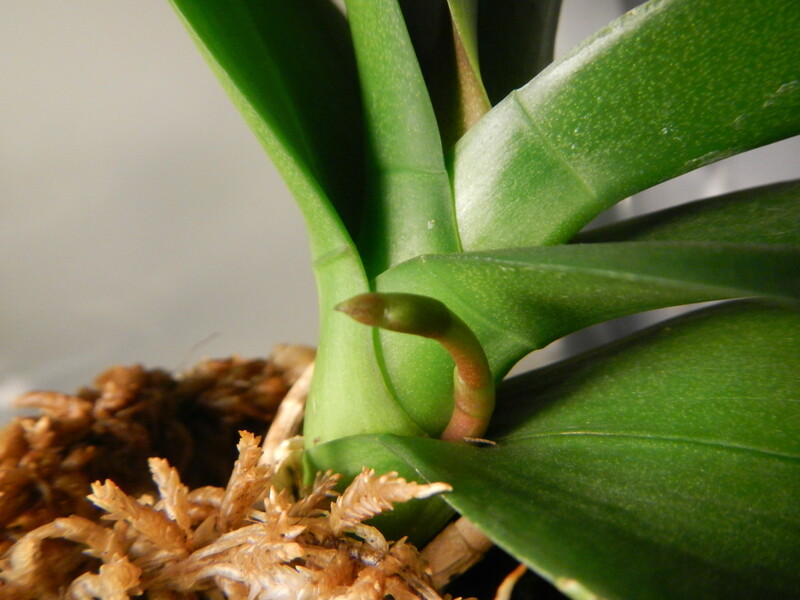 Orchids don't survive long when they're in sphagnum moss because it totally chokes them out. As mentioned above, the roots need sunlight and air to thrive. 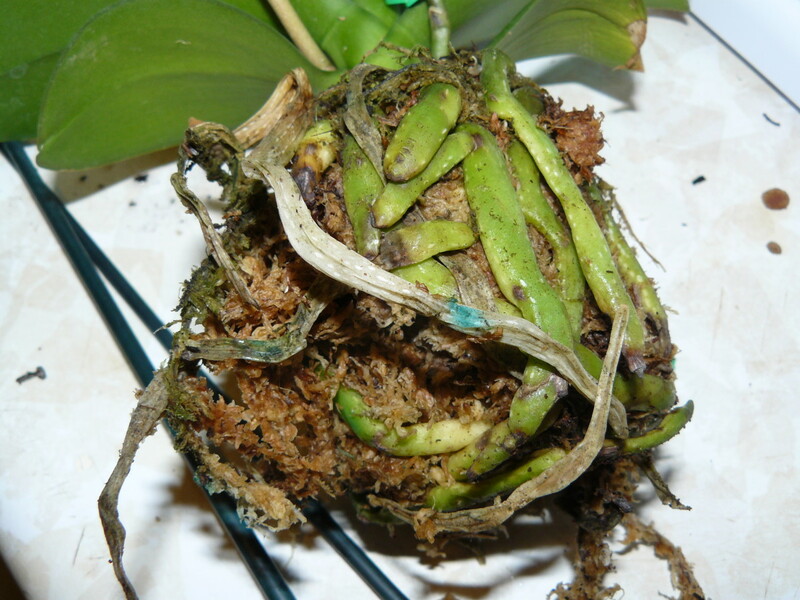 If you want to keep your orchid in sphag (NOT recommended by many growers), make sure to loosen it up a lot. Orchids like to dry out between waterings, but sphag likes to stay wet for weeks. The best medium I've read about seems to be a mixture of coconut husks and coarse bark. I use a commercial orchid mix and my plants love it. I've heard styrofoam popcorn works well too in wetter areas. Who'd have thought styrofoam would be beneficial to plants? I've read books and seen people on TV talk about using a well-draining cactus soil and orchid bark mix. I see it being beneficial because orchids are hungry little guys and cactus soil has more nutrients than bark mix, but again you're using something that is going to stay wet for too long and is going to restrict air flow from the roots. I've heard controversy about trimming dead roots. Some people do it to stop rot and disease, some (myself included) leave them incase they aren't dead. I also leave them for anchoring purposes. I do trim my dead spikes, as they are no longer doing anything for the plant. 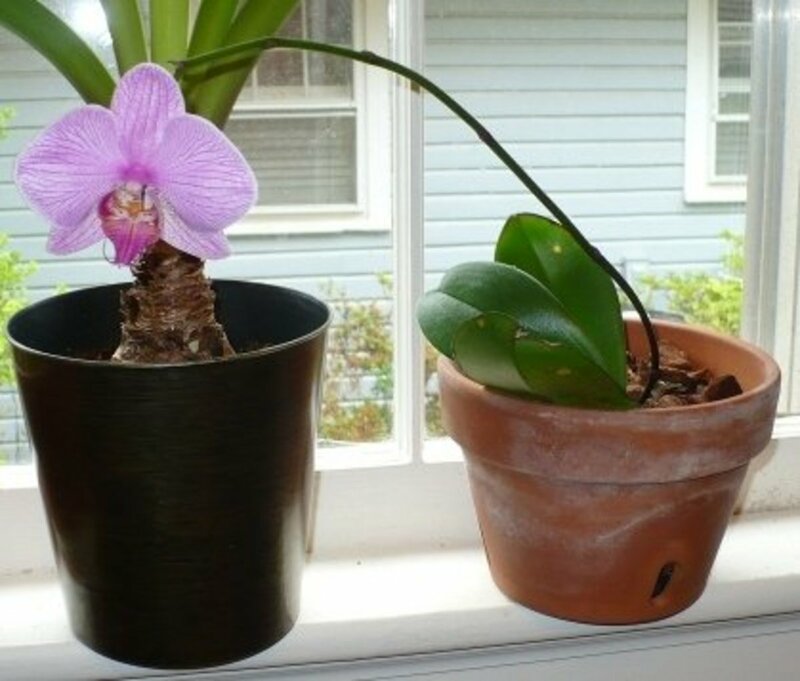 Should You Cut Off the Dead Orchids? You can deadhead your flowers, but I've heard arguments that the plant re-absorbs nutrients through them. Cut the spike back to the closest node and a new spike can form. Now let's talk about pots. Orchids are often sold in terra cotta and glass pots with no drainage. That isn't good for any plant. When you pick a pot keep in mind that your roots need the sunlight and proper airflow. I like clear plastic. I got a pack of ten pots for $5.00 or so from Lee Valley. The have slits all the way around from top to bottom. They work beautifully. There are some plastic nets you can use. I've heard great success stories. There are terra cotta pots at Wal Mart labeled as "Orchid Pots," I wouldn't recommend them because they only one puny drainage hole in the bottom and don't allow proper air flow. Light, Humidity, Food, Water, Etc. Phalaenopsis Orchids like bright filtered light. You will know if you have them in too much sun because their leaves actually sunburn. I grow my Orchids in a greenhouse with a relative humidity between 65-90% depending on the time of day. A humidity tray works just as well. I've even used a topping of Fat Bog Moss on the orchid bark to increase humidity. My Phal really liked it. What works for me may not work for you. I live in a harsh climate (Growing zone 2a) so I have to water often. There is also ongoing debate as to whether soaking is a good idea or not. I soak mine once a week (about 20 min) and spritz with a spray bottle daily. 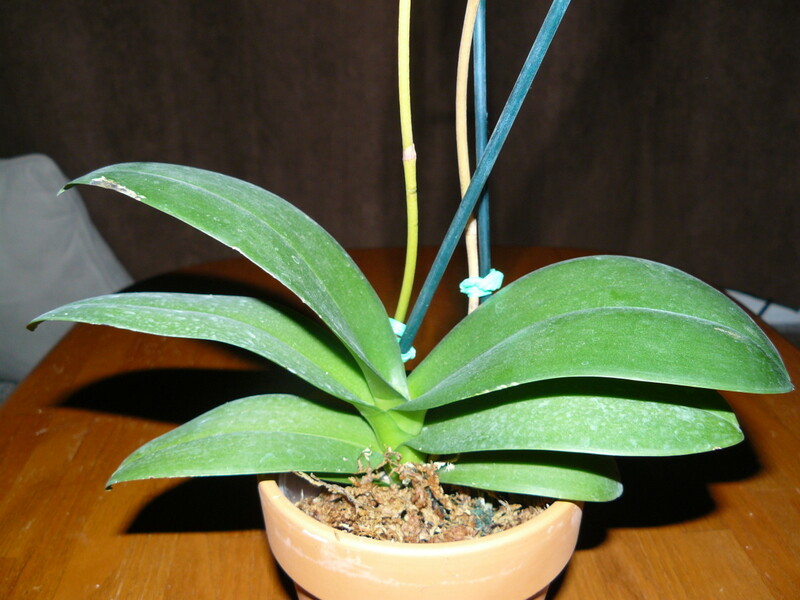 I feed with regular fertillizer (10-15-10) once a month (orchid bark doesn't have much for nutrients in it) through the slow-growth season (September to March) then during the active growth season (from the time she spikes until the flowers die) I use an orchid fertillizer (25-10-10) once a month. 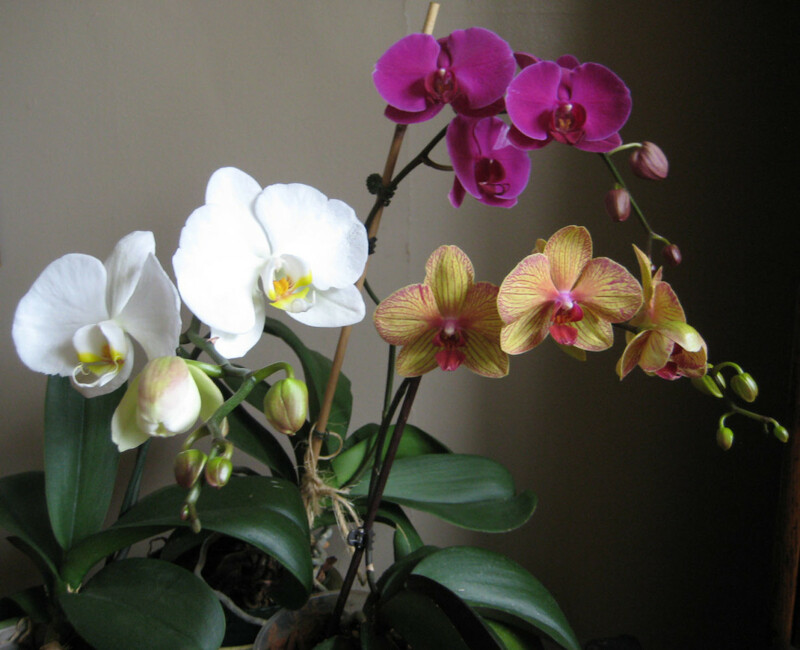 The rule of greenthumb with orchids is: You can water too much, but never too often. Meaning you can over soak them, or if your pot and medium do not allow adequate drainage, you can drown the roots. But if you take it to the tap and run tepid water over it every day, chances are, you won't kill it. If you still want to know how to develop a watering schedule, put a bamboo skewer into the pot. If it's dry when you pull it out, it's time to water. 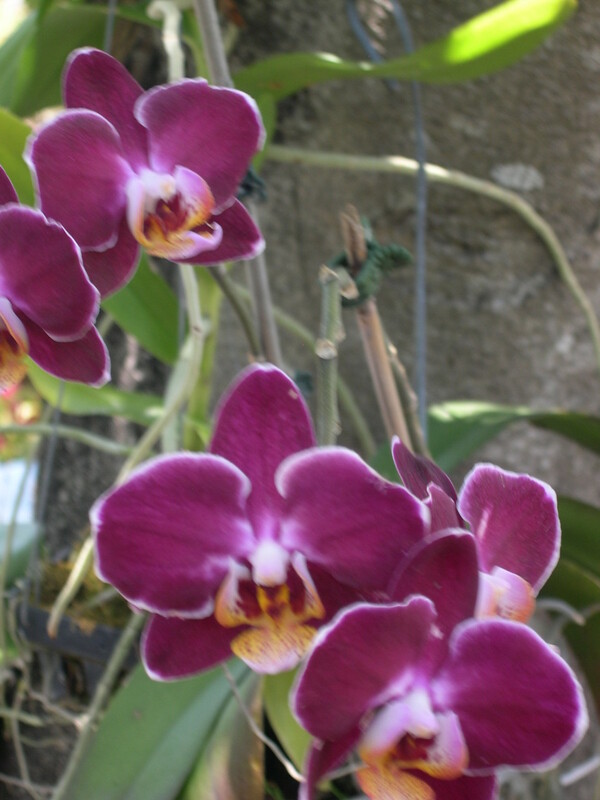 How to pollinate Phalaenopsis and other orchids in the greenhouse. After all flowers have fallen off my orchid, do I cut off the stem? Wait until the stem is dead and dried up. Your plant is re absorbing the nutrients through it. 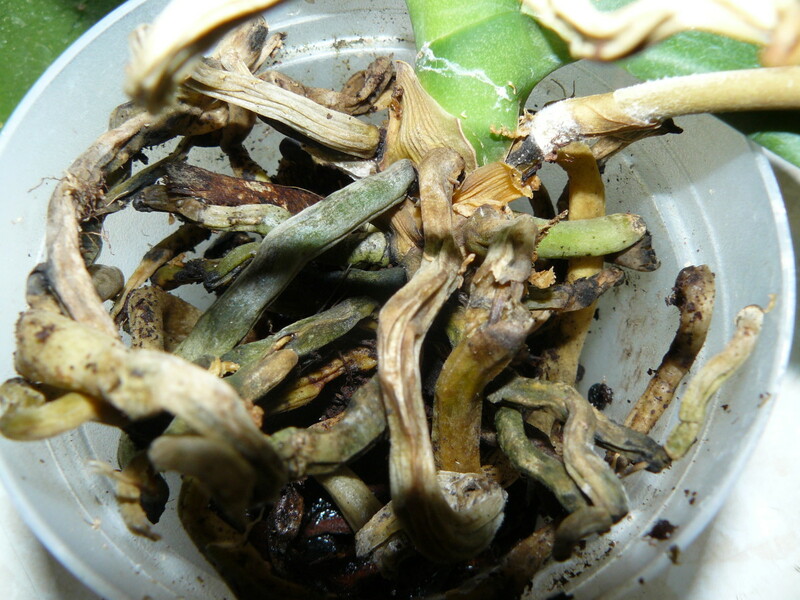 I have cut the stems above the second nodules however the ends have just dried up and haven't produced any new growth. Can anyone tell me how to fix this so I can get it to flower again. Thanks in advance. Don't give up! They're probably just holding a grudge against you for leaving them out, and they LOVE to test your patience. Happy growing! Love it and thank you. Left mine outside for a bit, storm came and that was the end of the flowers. I'm still holding out hope for future ones! Great hub, good pics and good info! Oh if I could get my hands on some mature Nepenthes I'd be the happiest girl in the world. I brought my venus fly trap home today (against my husbands advice... good thing he is a forgiving man). This will be my second. I lost my first when my roommate fed it hamburger. I have some Prism seeds in the green house now. I'll definitely be putting a hub together if anything happens. I've be interested to hear how you do with the carnivores. I completely failed with venus fly traps, but had more success with nepenthes. Unfortunately lost it a couple of years ago in a harsh winter when it got too cold in my house. You're going to love your new pots. It was the best thing I did for mine. Unfortunately, our harsh climate makes growing exotic houseplants a challenge, so I can't just go to the gardening store and buy those pots. I have to find an online supplier soon, Diana's about to crawl right out of her pot and find a new home. If it wasn't so dry here I'd probably try mounting them. Having read your hub I went out and brought proper clear orchid pots for them all (only one of them originally came in a clear pot. I've had to move them nearer the window too - it's been such a dismal summer here that the leaves were losing colour (which has never happened before). 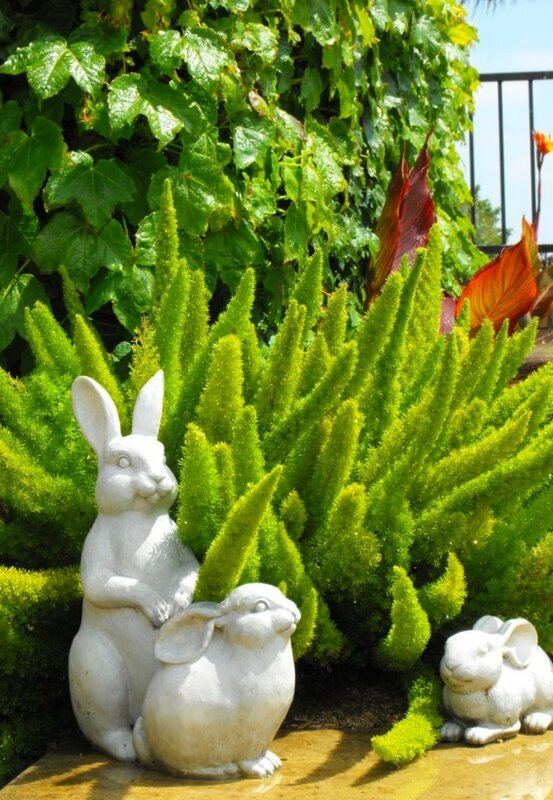 I'm sure your will repay you with a great display eventually now that they are growing vigorously and well cared for. You are doing better than I am; my phals have not spiked yet. I didn't expect them to with the condition they were in when I brought them home. Their roots and leaves are growing like crazy....but I'm still impatiently waiting for flowers. my least successful is a zygopetallum because that hasn't flowered again since I got it. I also have a phalaenopsis which flowers every year and another one with strappy reed like leaves - forgotten its name, but it flowers most years. Thanks! I'm glad someone found it useful! Now, like a true Orchid Geek, I'm going to ask you how many and what kind? Really interesting to read how you got both plants from looking like dismal doomed to die orchids to lovely and healthy and sprouting new leaves. I am going to follow some of your tips with my orchids.